AL FARES INTERNATIONAL TENTS, one of the leading Tents & Tensile shade manufacturer in the United Arab Emirates providing their services locally and the International Markets. AL FARES INTL. 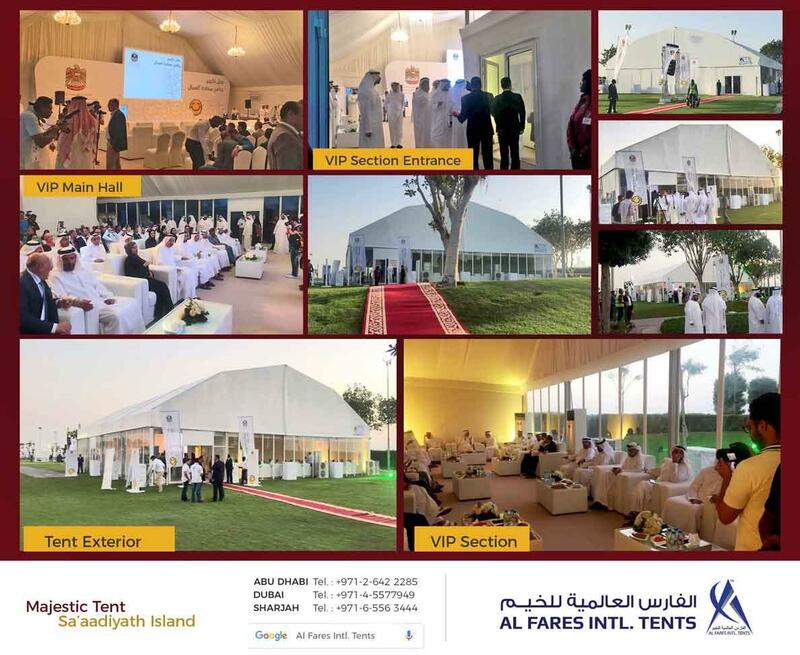 TENTS specialized in providing temporary and permanent Tent solutions for the Military, Sports events, Exhibitions and for the Corporate and special Event’s venues. Our expertise in providing solutions for temporary venues for large events are well appreciated by our clients. 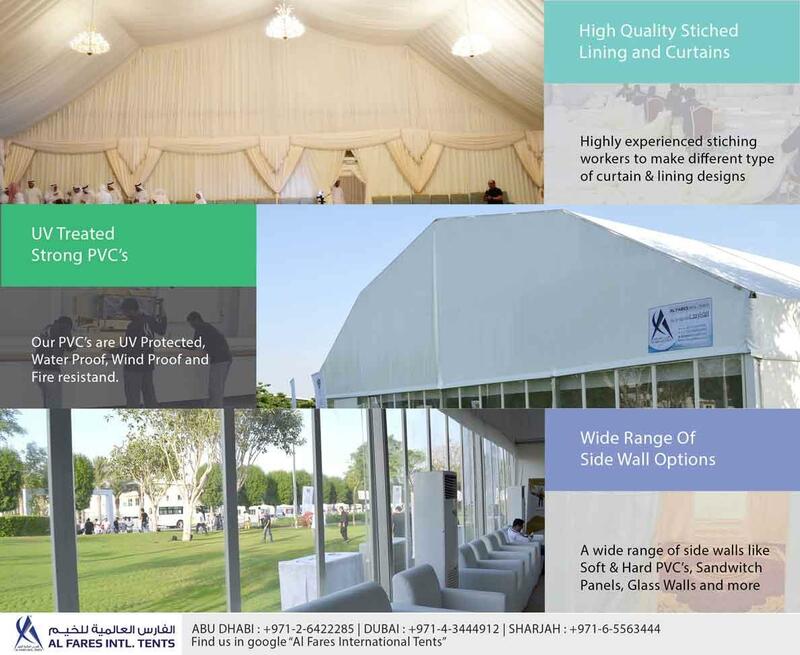 PVC-Aluminum Tent products such as Event solutions, Military solutions, Storage solutions, Sports venue solutions, Parking shade solutions are highly in demand which are customized and suited for specific need of the customers. Our services are available for Large-Medium-Small events and many more. Our product line includes all kinds PVC- Aluminum tents, Tensile fabric shades and Parking shades. 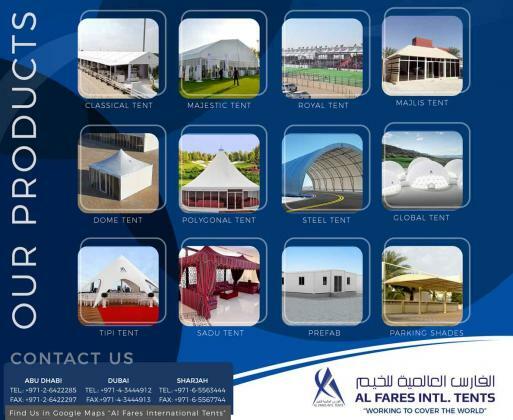 AL FARES INTL.TENT’S manufacturing facility is equipped with latest technology and highly sophisticated machinery for the design, engineering and manufacturing of Tents and Tensile shade products. AL FARES INTL. TENT’S expertise in design and engineering of Mobile structures are compliant with International standards BS EN 1999-1-2:2007 / BS 1192:2007 and committed to meet the expectations of our customers through continuous strive to improve the effectiveness of Quality management standards of ISO:9001& OHSAS:18001.